Glen Ellyn Hardwood Flooring – Carol Stream, Wheaton & MORE! Enrich the appearance and functionality of your kitchen with flooring from our Glen Ellyn hardwood flooring selection. Our design experts will meet with you to discuss your home’s decor, layout, and your preferences. We guarantee you’ll find flooring you’ll love because we have it all! Carpeting, Area Rugs, Hardwood, LVT, Tile & More! DeSitter Flooring is dedicated to our customer satisfaction and providing the best flooring available. 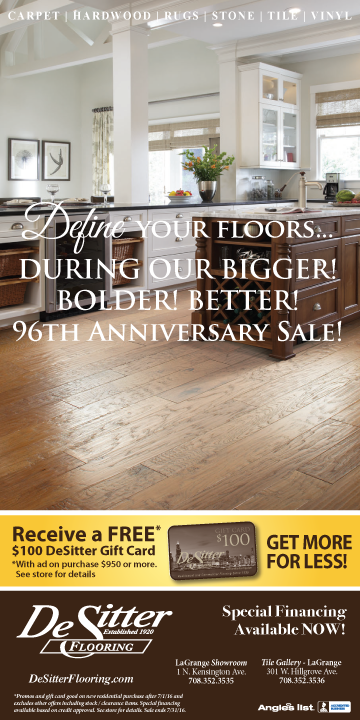 Get started today by calling (630) 771-1420 or contacting us for a free estimate on your Glen Ellyn Hardwood flooring. DeSitter is celebrating 96 wonderful years of business and as a thank you to our amazing customers, we are having a huge sale! Hurry in! Summer is almost here! – Glen Ellyn, LaGrange, Carol Stream, Hindale, & More!